New here? Make sure you visit our Introduction to First Piano Lessons before you start! 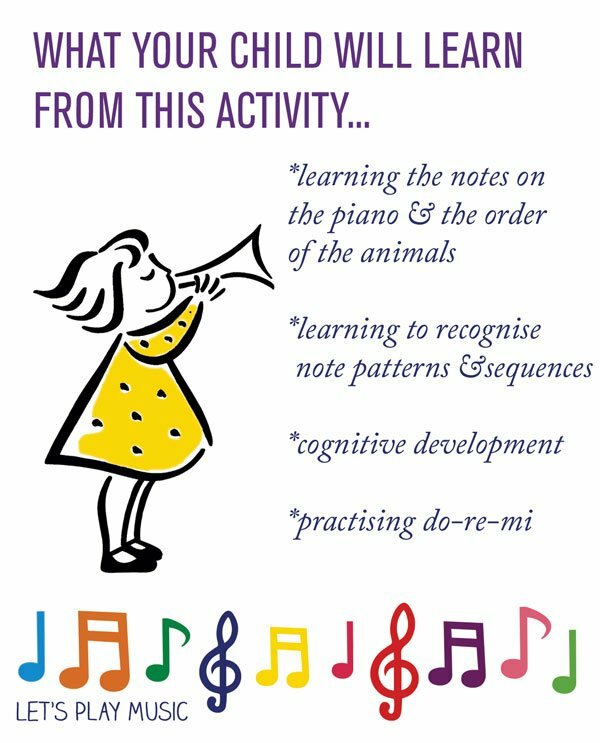 There are many methods to help learn piano notes but this way is easy and children immediately engage with this animal memory game. They are so keen to memorise the order of the animals that they inadvertently learn the piano keys without realising it! The whole keyboard stretching out in front of them can be a bit overwhelming, so firstly it is important to break it down and help to them recognise that there are indeed only 7 notes, just repeated over and over. Ask them how many they think there are? Surprise them with the answer of only 7! Kids love the idea that they can impress others with this “trick” question! Depending on the age and attention span of your child or the child you are teaching, to make it easier this lesson can be broken up into two sections which introduces C-D-E-F first, and then G-A-B the next time. 1. Sitting in front of the keyboard, explain that the right hand plays high notes, and the left hand plays low notes simply because it is more comfortable to do so. Encourage them to explore some high and low notes, and make sure they can tell the difference. 2. Start by asking them to play the groups of 2 black notes and 3 black notes, all the way up and down the keyboard, making sure to use the left hand for low notes and the right for high. 3. Then find middle C by looking for the 2 black notes in the middle – C comes just before these 2 black notes. Introduce the CAT! Find all the ‘cats’ up and down the piano, using the right hand for high ones and left hand for low ones with middle C in the middle. Navigate by looking for the 2 black keys, and notice that they are always the same distance of 8 notes apart each time, call this an Octave. Eight notes like an octopus with 8 legs! 4. The next note is D for DOG! It comes after C and is in between the 2 black notes, which look like the dog’s black ears! Find all the Ds. 5. E for ELEPHANT comes next, find all the elephants by hopping up and down the keyboard, noticing that it comes on the other side of the 2 black keys. 6. The next note is F for FROG! Repeat the hopping game in the same way, noticing that it comes before the group of 3 black notes. 7. The next note is G for GIRAFFE, find all the Gs up and down the keyboard, always making sure that the right hand is used for higher than middle C, and the left hand is used for lower than middle C.
8. A for ANTS comes next, notice that the first and lowest note on the full piano keyboard is an A . 9. The last one is B for BEAR – repeat the process, and all the notes have been named, as we have reached C again! Now try to see if they can remember all the animals from beginning to end of an octave. Although this seems a lot of information for the first piano lesson, children really seem to enjoy the challenge of remembering the correct order of the animals. After a little bit of practice they love to demonstrate that they can recognise which one is which. Play this game at the start of every lesson. Once they are more confident, jumble the animals up, and pick different ones at random. See if they can name them backwards – though this is difficult at first! Pianos keyboards vary according to size and budget. A full size piano keyboard has 88 notes from the bottom to the top including all the black notes in between starting on the bottom A up to a top C. A mini-piano or smaller keyboard may have a few less notes at the top or bottom, but this doesn’t make a lot of difference for beginners, as they rarely need these notes anyway. Whatever the size of your keyboard, you will find they all share this repeated pattern of keys as described above and this is the easiest way to learn the notes on the piano. 5 . The Dice Game – a fun way to practice! 6. Beginner Piano Finger Note Pets! 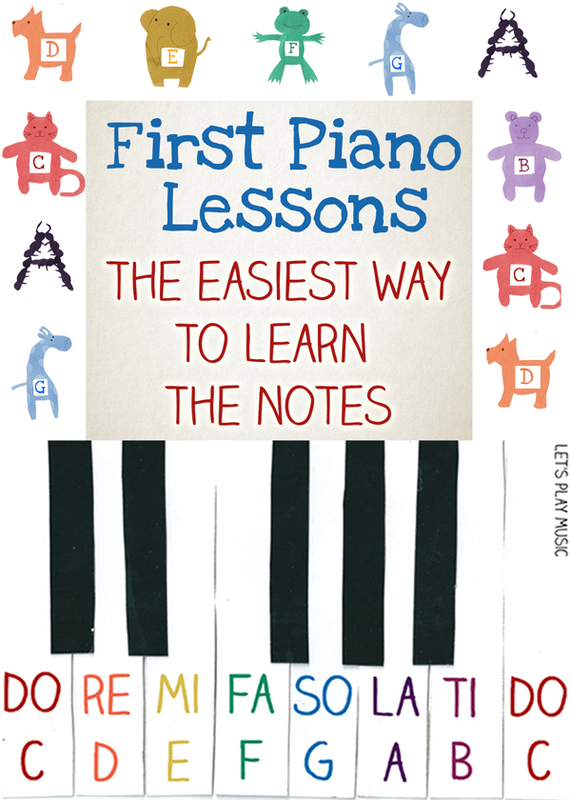 Check out our First Piano Lessons eBook for lots of fun piano beginner’s resources & support! 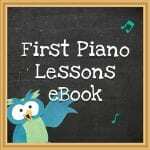 I would like to purchase “First Piano lessons Ebook”. But I dont have Paypal account. My husband has one but not work now. I noticed that I can use Credit card to pay, buy I cant process with Credit card. There only has one button to Process with Paypal. Do you have any suggestion? Hi Ann! Sorry I missed your comment earlier because our different time zones. But I’m so glad you did overcome the problems you were having 🙂 I hope you and your son have fun with the ebook! Excellent lesson! Keep up the good work. I am so glad I found your website. My son just turned 5, and is keen about the piano. since I learnt how to play the piano by ear (was not trained by anyone), I have been pretty clueless on how to teach him in a way that is engaging and fun!! My budget does not permit me to hire a private trainer, so I have been looking for good resource. I am happy now!! I intend to purchase your e-book and use it to tutor him. If it goes well, I may just be the local music teacher. Thanks a lot Sara! Hi Evah, I’m so delighted! You are exactly the sort of person I had in mind when I was writing The First Piano Lessons eBook Good luck with the lessons! ? My son is a left handed. Do I need to teach him differently? Hi! Thank you so much for providing such incredible free piano resources. We were paying ALOT on 1x week 30 minute lessons for our kids and I was so sad when our budget couldn’t support it anymore! Then I found this site! Thank you so very VERY much! it really help me.. THANKS!!!! I’m so pleased! It does make it easier doesn’t it! 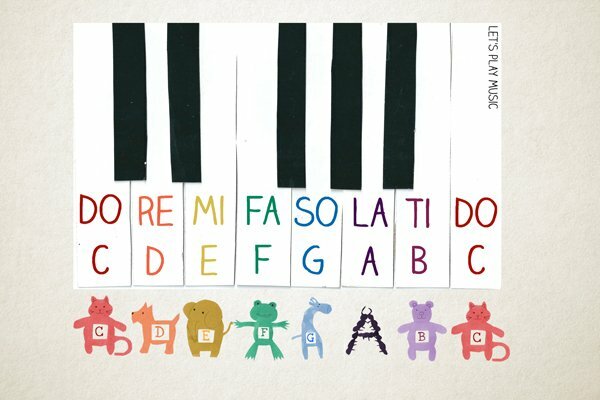 What books do you recommend for piano lessons? I learned on the Alfred’s books as a young child and I’m about to start with my 8 year old. My favourite piano tutor books are Chesters, they have a cute set of fun characters and offer a good clear introduction to the basics and kids always love them. Chesters also have lots of additional support books like easy first Jazzy pieces and simple arrangements of well known tunes. Of course there are tons of other great tutor books out there and I often pick and choose extra pieces from other sources to keep them interested and this builds up a fun repertoire. Thanks Sara! I’ll look into them! Just trying to get started! I am so glad I found this site! So many great ideas! Amazing! Hi authors of this website. I´am sorry, my English is not good, but I must write you, because your work is really exellent! I started to teach playing piano without informations how to teach. Of course, there are older musicians at our music school, who could help me, but their style is completely without interesting idea, without energy. I studied playing piano lots of years, but style of their teaching was all the time the same. And I wanted to start with something extra, because I have starters in my class. Your web site gave me a big inpiration, I must remake the materials into our native language of course, but the ideas are so funny for children and in connection with basic Czech piano books it fulls whole lessons in funny and interesting way. So, thank you for your work, for inspiration and I am looking forward to next tips and ideas for my children. Hello! 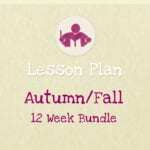 I am new at teaching piano lessons, and am currently putting my curriculum together. How do you encourage daily practice? I currently have a 5 year old, 2 6 year olds, and a 9 year old, all at beginner levels. Any ideas? Sometimes kids are naturally very keen to practice which is a joy to us piano teachers! But most often than not they need a bit a gentle prod! I find a practice chart inside their practice book, with the days of the week for a parent to tick off works well, with perhaps an agreed treat as a reward on completion. Practice marbles in a jar are also popular. 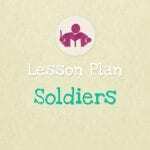 I always play The Dice Game at the end of every lesson for young beginners, it’s a fun way to recap over all the pieces and exercises that they have learnt in the lesson and completing the game should always be rewarded with a big shiny sticker! So glad to found your site. This is a wonder idea. Is there anyway to download the animals? Wanna use them for my preschooler. Thanks so much! We’re working on an eBook at the moment which will include printables for the First Piano Lessons – hopefully it will be ready within the next month or so, so keep an eye out either here or on Facebook! Do you have a printable of your cute animal graphics? wow. what a great site! i love the technique and i appreciate the funky graphics! love the art here. the animals are so cute. thanks so much for sharing your great ideas!!! Thanks Maia! Glad you like our graphics, we really enjoy doing it! Thanks Jan, So glad you’re finding our First Piano Lessons useful for your Grandkids! 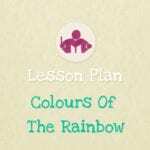 If you subscribe to our newsletter we’ll let you know when the printable teaching pack is available. I am starting to teach a few kids in our area and am starting the first one in a couple of weeks. I’ve found your site to be really helpful and I wondered if you had a template or a suggestion as to where I could find the little animals you have here for the first lesson? Did you actually put something on the keys or just have them in your hands when explaining? Often, teaching kids is teaching parents. What fun ….for the love of music! Completely agree Pat! Thanks for commenting! This is really helpful. So how do you actually use the animals? Do you show them the animal chart as you explain the keys to them? Do you make animal cut-outs and shuffle them around on the keys? Hi Alison, I don’t use the actual animal pictures in the lessons, they just really help the children learn the notes in the correct order. You could ask the children to draw or colour in the animals on a printed keyboard on the correct keys for extra practice though. This is great! I love it and I am going to share it. Great ideas! Love them all! Thanks for sharing! Please can someone tell me at what grade can you teach piano to 4-7yr olds? Thanks Christiana, you’re welcome, we’re very glad you like our ideas! In the UK we have a different grade/year system to American schooling so it is difficult for me to answer that. I feel it is important to be led by the level of interest from the child, sometimes really young ones are keen to have a go, but some children aren’t ready till a bit later on. It is best to be led by the child, start with very short lessons, but try to play the practise games regularly. Children soon let you know when they are ready for more! Good luck! What a wonderful way to teach the notes in a way that a child can relate to! Really brilliant! What a creative introduction to notes on the piano! Thanks so much for sharing at the After School Linky. Thank you so much for this introduction to piano. I am definitely going to profile this post next Monday in my host post for Afterschool! Thanks Natalie! The introduction to piano series is lots of fun, thank you for hosting and for choosing our post! Great idea to teach the notes! I love relating what we are learning to stories or things that my children really like. This would work great. Thanks so much for sharing. Hope to see you at True Aim! Cute! When I am teaching piano to new beginners, I find that D is the easiest note to find since it looks like an Oreo cookie. D is the white filling between two black cookies. Works like a charm every time! What a fun idea! With my animal method, the Dog has two black ears! It’s funny what we come up with to engage kids! but if it works – it’s worth it!